Description: Stoloniferous perennial to 0.4 m high, rooting and branching from the nodes. Leaves with sheath densely to sparsely pilose; ligule 1–1.5 mm long; blade 1–3 mm wide, usually glabrous, green to bluish green. 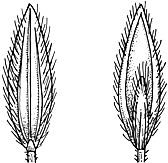 Racemes 2–4, 2–7 cm long, the spikelets appressed, rather crowded and somewhat imbricate, paired on unequal pedicels, the longer pedicel to 2 mm long, the other very short. Spikelets 2–2.75 mm long. Lower glume minute; upper glume c. 60–75% as long as the spikelet, 3-nerved, with fine white hairs along the margins and sometimes also on the interspaces. Sterile lemma equalling the spikelet, 7-nerved with the nerves prominent, finely hairy along the margins and often also between the lateral nerves. Fertile floret very slightly shorter than the sterile lemma, yellowish or rarely tinged with purple, almost smooth. Distribution and occurrence: Grows in damp sandy soil; grown as a lawn grass.